VersaDesk Power Pro is the most advanced desktop system available today! The sleek design allows for straight up and down adjustment for optimal use of space. Our drive systems have been rigorously tested for over 120,000 cycles (roughly 50 years of use). Each drive system has a machine ground hardened stainless steel shaft that is capable of handling even the most demanding environments. Electric Lift Push Button Adjustment - Up to 20"
* Versa Products provides a lifetime warranty on the frame of this product, and a 3 year warranty on all motorized parts. VersaDesk is a leader in standing desk solutions that specialize in innovative designs for your office, at home, work space, or the hobbyist. Dealing directly with end-user companies and consumers, we are competitive and have the experience in creating purposeful and long-lasting office furniture. From urgent needs to specialized project requirements, you can be assured of the most professional, creative, personalized and prompt service in the industry. Our corporate strategy has been to produce quality products at a fair price, while keeping the environmental impact to an absolute minimum. Taking care of mother Earth is extremely important to the organization. Not only do we use recycled materials, our wood is purchased from sustainable forests that replant each area they harvest. Even our manufacturing facility and offices use over 90% natural lighting to reduce energy consumption. We love our trees and we care for them by using a paperless order processing and a recycling system to reduce unnecessary waste. 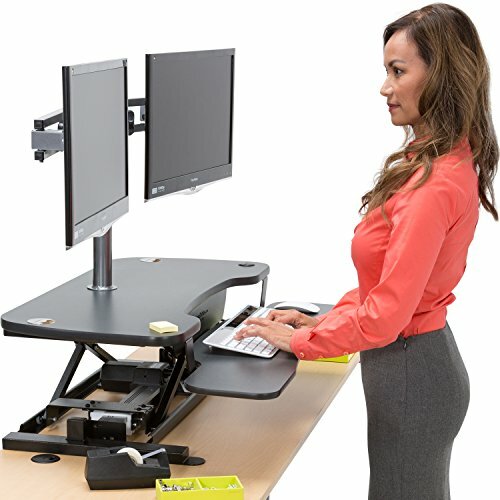 Electric Powered: With a push of a button, your desk riser will go from a sitting position to a standing position in seconds. No predetermined stopping points means that you can adjust the converter to your personal height preference (up to 20") which helps in dramatically reducing the risk of musculoskeletal injuries. Powerful: You'll be impressed with the motor on our VersaDesk as it will lift up to 80 lbs with no problem. Imagine having to use a manual lift every time you want to adjust your desk riser and you'll see why our VersaDesk is so popular. Ergonomic Design: The two-tier design of our workstation gives you an upper display surface for your monitor, and a lower spacious deck for your keyboard and mouse. Versitle: The VersaDesk has 3 standard 2" grommet holes that can be used for (1) mounting monitors (requires a mount purchased seperately), or (2) organizing various electronic cables associated with your monitor, mouse, keyboard or phone. Superior Quality: The VERSADESK is constructed of a carbon steel frame, and all moving parts have sealed ball bearing roller glider wheels for extra quiet and smooth ergonomic movements. The surfaces are fabricated with Wilsonart Commercial Grade Designer Laminates that will never scratch, dent or fade. This standing desk riser is made from the strong, high grade materials that won't disappoint!